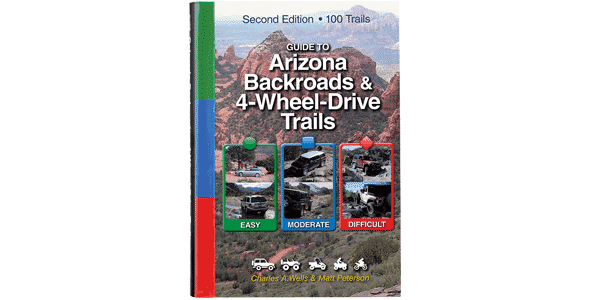 Starts and ends at Boulders OHV Area. A fun loop that starts and ends at the Boulders OHV Area. The first half of route uses trails frequented more by ATVs and UTVs; consequently the routes tend to be narrow and very steep in spots. However, we managed to drive it all in our brand new 2-door Rubicon without mishap. The second half of route follows wide, sandy wash bottoms. The Boulder OHV Area is very popular and has large open areas to camp, a modern vault toilet and a kids’ practice area. No fee is required. Extremely steep and very narrow in places. Perfect for ATVs, UTVs and dirt bikes. Manageable by short wheel-based 4x4s. Not for stock SUVs or over sized vehicles. Easy to get lost on complex network of trails. This route is not for kids.